Early in the new year I had the idea that I wanted to create a set of dishes in the ceramics workshop that I attend every Thursday afternoon at Signal Arts Centre, here in Bray. I planned to make these dishes with handbbuilding techniques rather than on the wheel and my plan was to paint them with tulip designs. Yellow tulips are probably my favourite flower and I have loads of sketches of them. First off, I had to find two large plates with slight curves, but not too many folds, as formers. 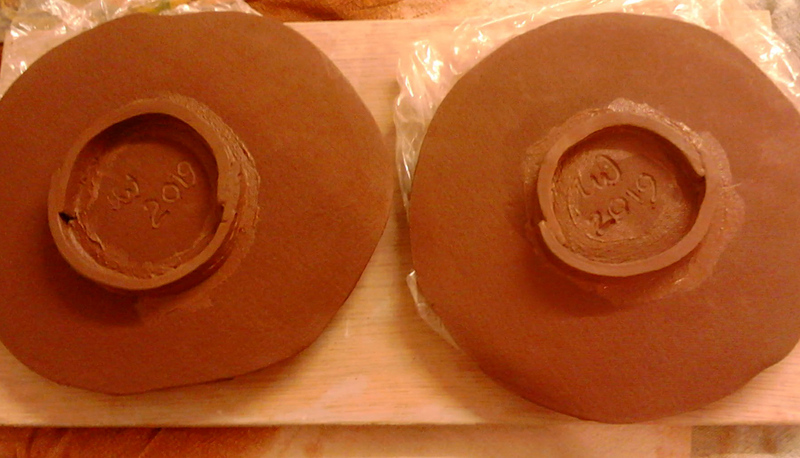 I hadn't firmly decided on terracotta clay for the set, but I used terracotta to start with. 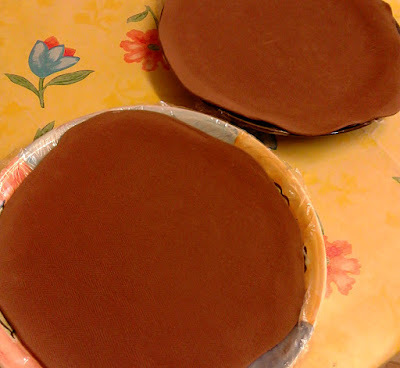 For smaller plates I used the plastic lids from pudding bowls as formers because they had a gentle curve over which I could drape a slab. NB cling film must be placed between any former that isn't plaster in order that clay won't stick to it. 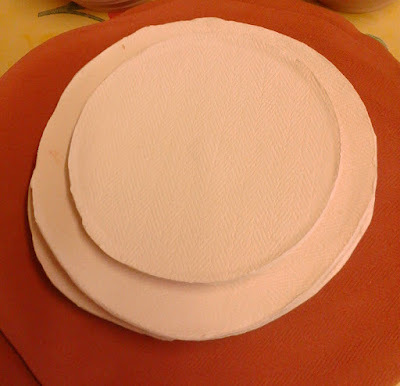 I decided that the small plates would have feet, and this picture shows the necessary scoring where the feet will be placed. 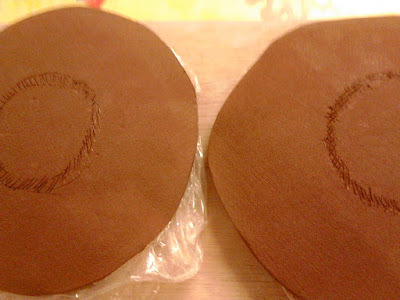 Instead of one solid foot, I decided to make a design with two arcs for the feet. 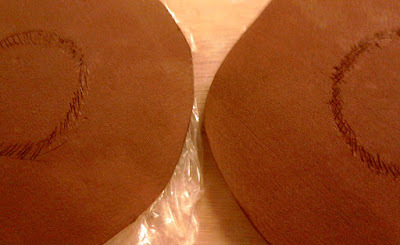 This picture shows the scoring of the foot (it is on a cloth) before placing, after applying the slip bond, onto the corresponding scoring on the plate. 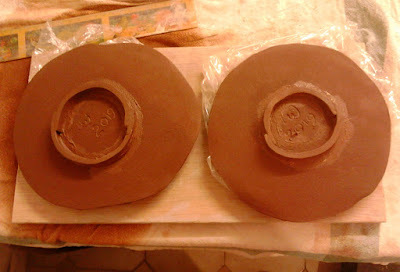 Here are the two small plates with their feet attached and my initials and date within the circumferences of the feet. I have been reading quite a lot over the past few years, the picture below shows a sample of books I have been enjoying lately: political philosophy, poetry, biography, creative non-fiction and essays. 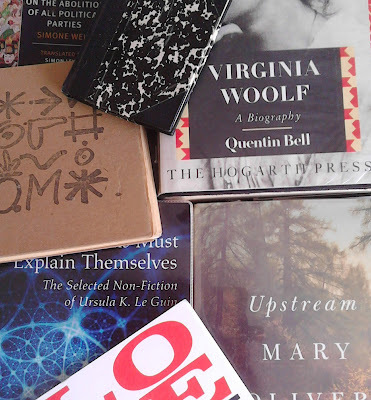 A lot of my reading material is suggested to me by Brainpickings (link in "Inspirations" sidebar) which is put together by the brilliant Bulgarian ex-pat in NYC, Maria Popova. 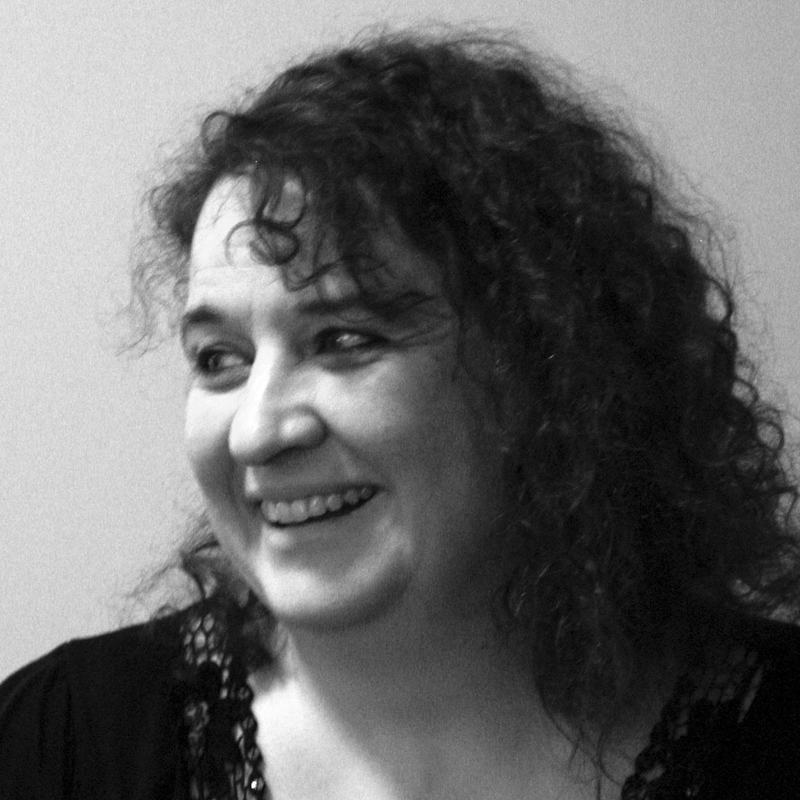 I have been subscribing to Popova's weekly compendium of essays and reviews for a number of years now, and I think she is probably one of the most erudite thinkers and writers currently around! Popova is the mover behind the annual Universe in Verse event in NYC, a fundraiser for the environment that brings together poetry and science. If you don't happen to live in NYC, you can catch up on the 2017 and 2018 events here. The 2019 event takes place at the end of this month and will also be live-streamed. I expect that it, as with the previous years, will be made available later in full. April is poetry month, and as in previous years, I have been doing the poem-a-day challenge. 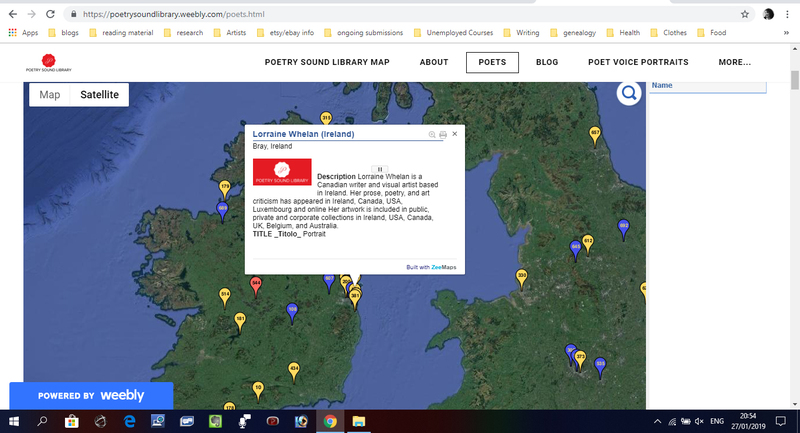 I follow the website for Na/GloPoWriMo (National/Global Poetry Writing Month), which gives daily prompts and links to poetry based resources. It is fun, challenging, and useful to my own writing practice. The poem-a-day helps me focus and I often write things I probably wouldn't write otherwise. I have the months following April to go back to these poems and revise, but for now, I just need to get them written! 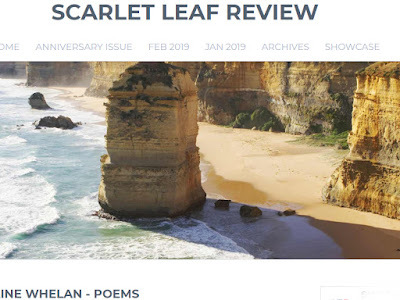 One of the poems I initially wrote for Na/GloPoWriMo, Thingvellir at Night, has recently been published online in Scarlet Leaf Review, along with several others. I have not yet figured out what the difference is between essay, memoir, and creative non-fiction, but regardless, I was delighted that my work, Holding It Together - bookbinding as memorial - was published online last week in Abstract: Contemporary Expressions. Although poetry and art criticism (and letter writing!) have always been my main modes of writing, in the past few years, I have expanded to include other forms - fiction, memoir, non-fiction. 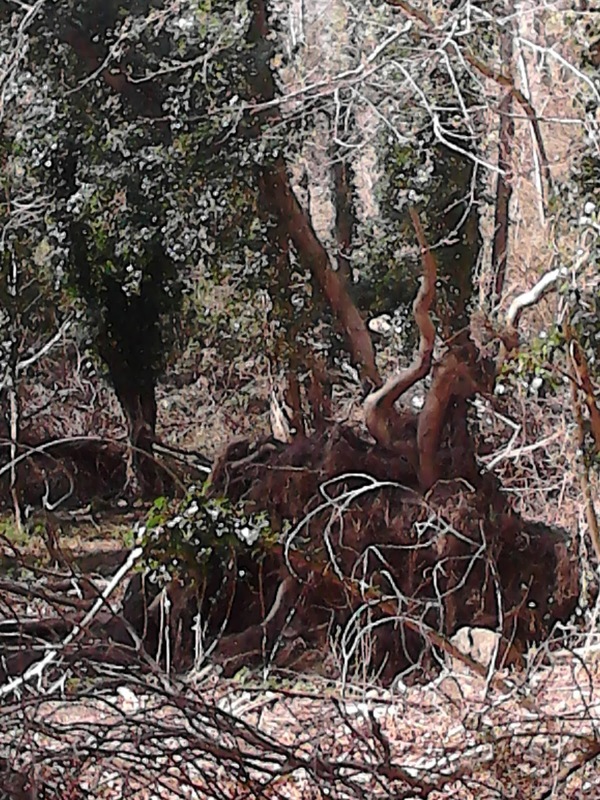 I was especially delighted when my short story, Prayers for My Children, was published online in Issue 7: Continuity by Tales from the Forest; poems have also been published in Issue 6: How it Begins and Issue 9: Limits. 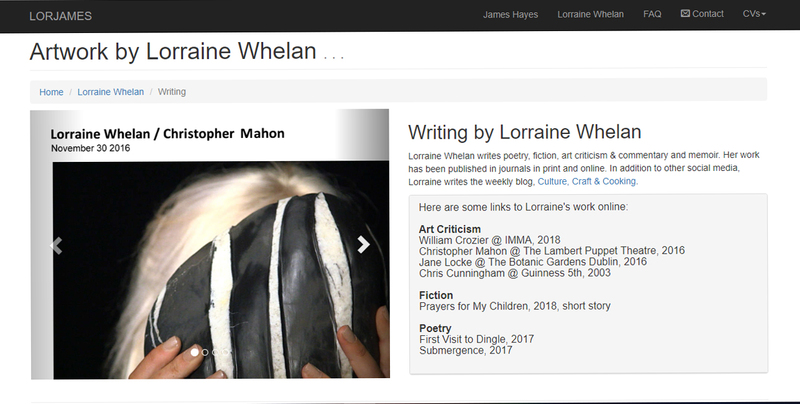 For further links to my writing, please see my webpage lorjames.com and follow the links through the "writing" section. 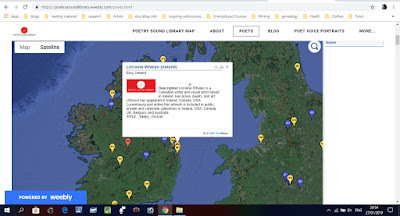 Back in January of this year, there was a call for poets to read one of their poems for Poetry Sound Map. 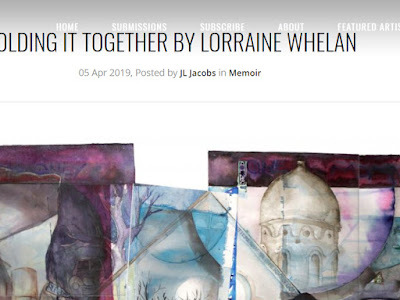 I decided to make a recording of one of my older poems Portrait, which was published in either 1989 or 1990 in New Irish Writing, a feature of The Sunday Tribune at the time (now it is a feature of The Irish Times). 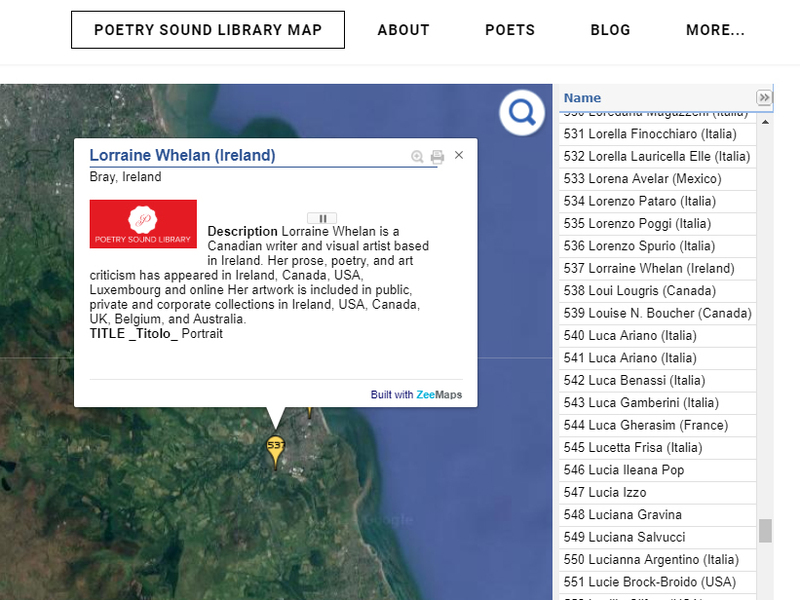 I am very happy to be included on the world map of recordings from poets alive and dead - I am in great company! 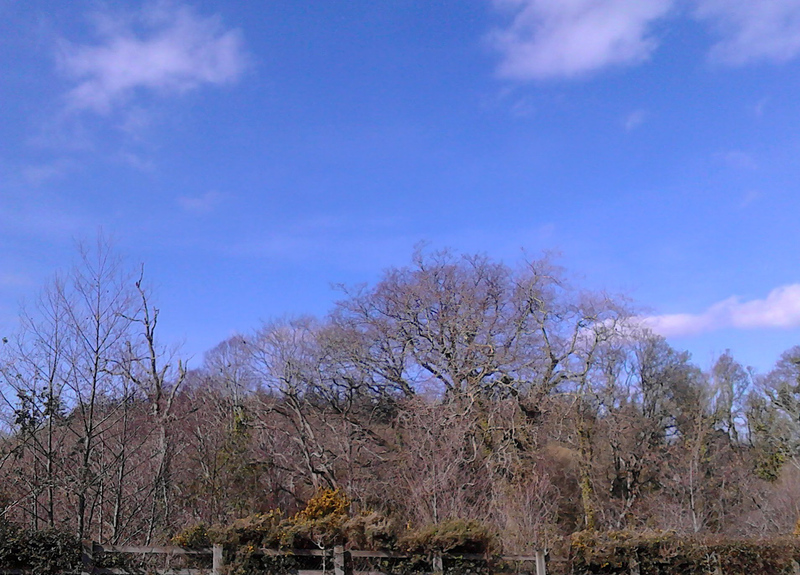 One glorious day last week (18C!) I was down the town doing some errands, and really feeling like summer, never mind spring, was here. Magnolia and blossom trees were flowering beautifully. I expect there'll be petal pollution soon. That same day, while waiting for a bus, I was simply delighted by the blue sky. Though the trees were still bare, they were noticeably budding and will be leafy very, very soon. A huge part of spring, is the cleaning part. Actually, this attic work has been ongoing for a few months -- as I have been trying to reorganise my studio space for guests coming soon in a few weeks, and for me to get back to work in it following their departure. 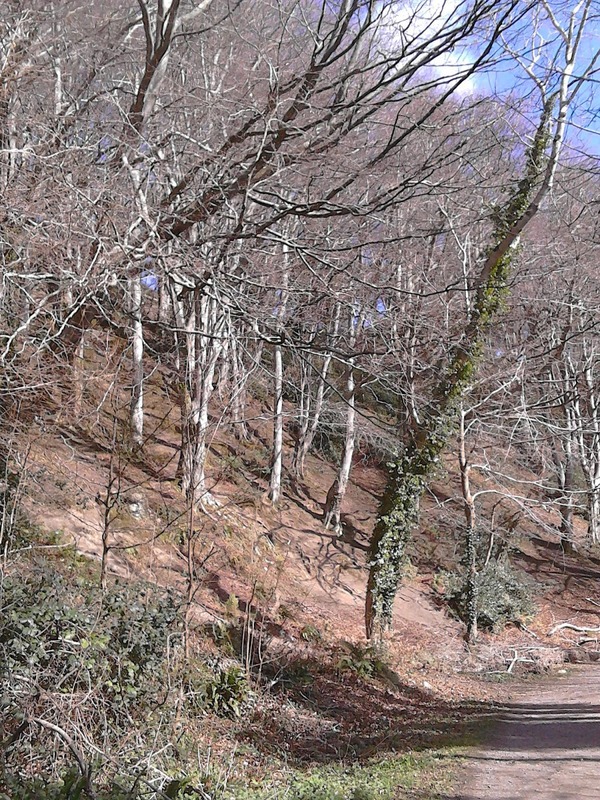 These pictures of a disaster-area space are in stark contrast with the way it looks now! 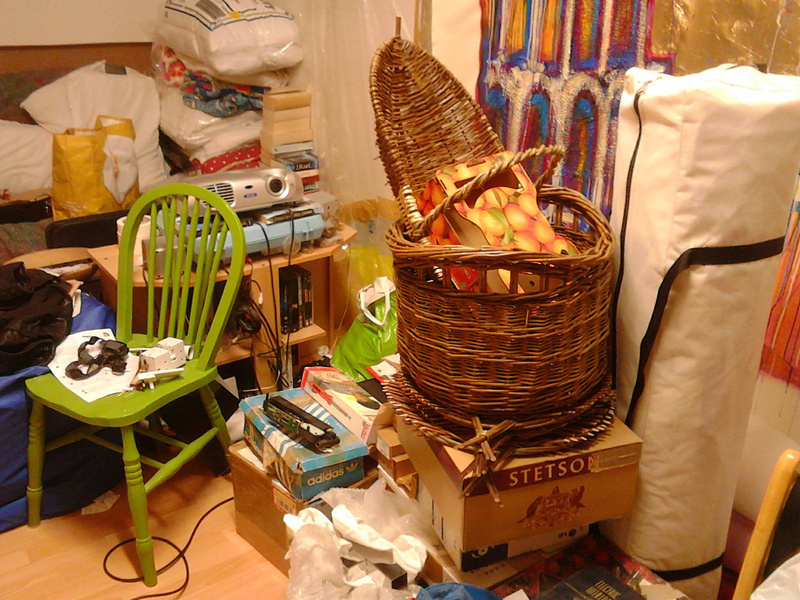 Many items have been recycled, thrown out, or homes have been found for them. 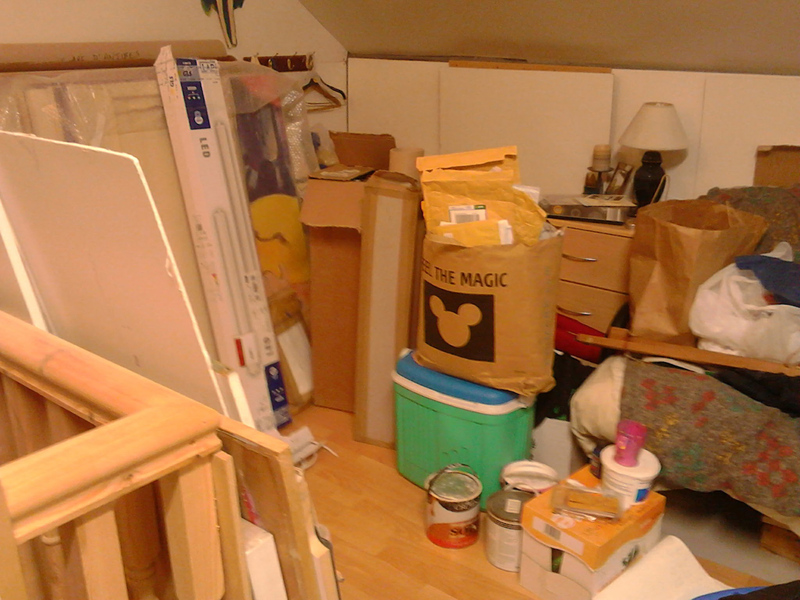 It is very satisfying to go up to the attic studio and NOT see this anymore. Another sign of spring is Mothering Sunday, i..e., Mother's Day here in Ireland (always in March, not in May like North America). I am a mother and this is my bouquet of spring flowers. Spring definitely seems to be here! 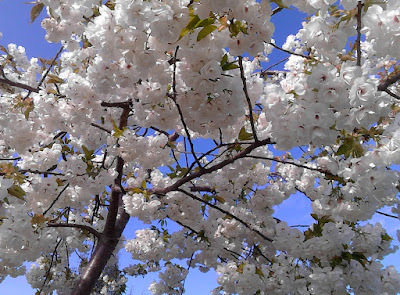 Lately, I have seen so many beautiful trees in full bloom - magnolias, cherry blossom, apple blossom - and the days are getting brighter and longer. 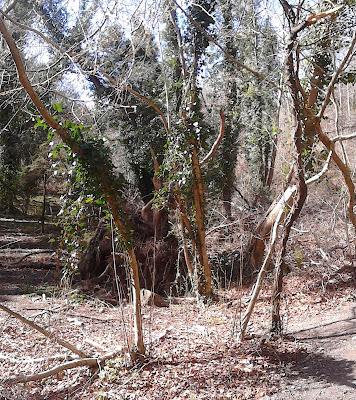 Sunday was a perfect day to go for some much-needed shinrinyoku, that is, forest bathing. Not far from my home is the lovely village of Enniskerry, where one of my favourite outdoor places, Knocksink Woods, is located. 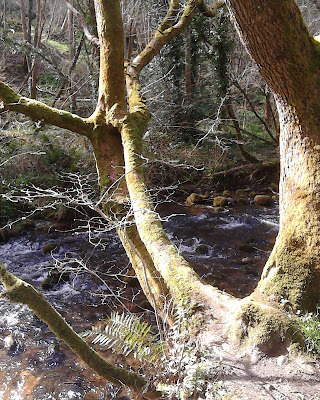 It is a wood divided by the Glencullen River's quick flow. 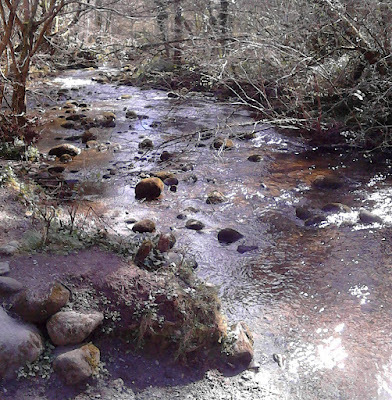 This reminds me of Taylor Creek in Toronto (where I grew up); it is the kind of "river" where the bottom can easily be seen and one can get to the other side by getting your feet a little wet or stepping on stones. Knocksink Woods does have several sturdy bridges though, so there is no problem exploring either bank without wet feet. And a game of Pooh Sticks is de rigeur for every bridge. 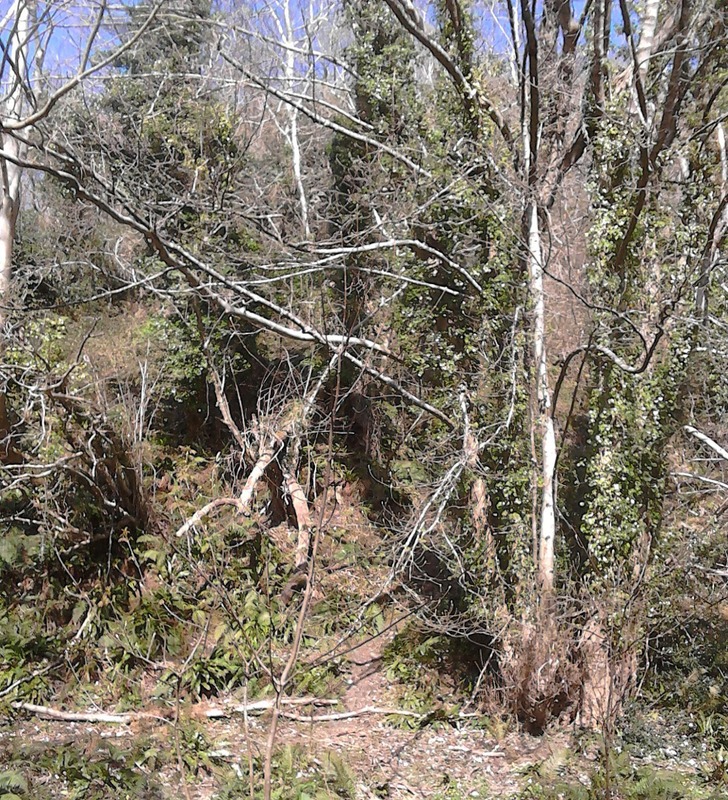 The sun was shining quite a bit. 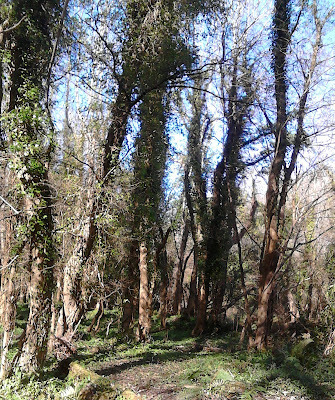 I didn't bring my sketchbook with me, but I love all the spindly trees. 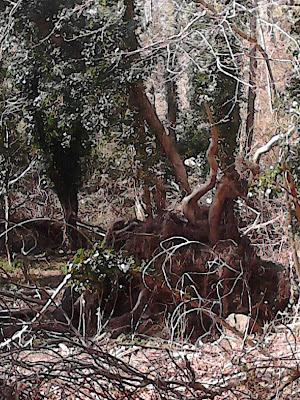 And spindly branches and gnarly trees. 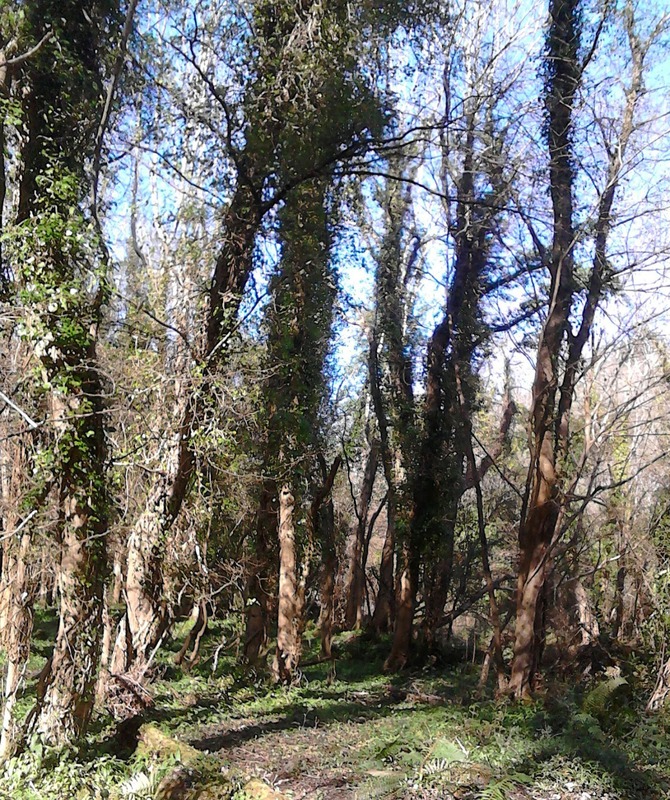 To my surprise the wild garlic ground cover in shady areas was coming up healthily! Though I didn't expect to see it, I had brought a collecting bag and picked enough leaves to make some wild garlic pesto to go with dinner. There were even flower buds; I will return next week (weather permitting) to do a bigger forage and make batches of pesto for the freezer too. I make wild garlic pesto every year and a full recipe with pictures can be found on a previous post, here. 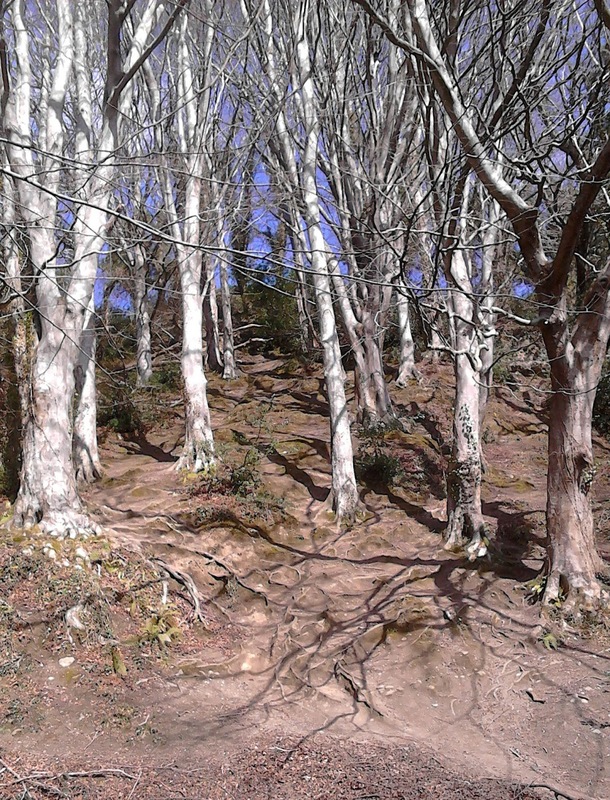 with shadows undulating on the uneven ground of the hill. I have been transcribing from my dream diaries, most diligently since last June, as it is a necessary thing for me to do - before I am unable to read my own scrawl and also to refresh my memory about images and concepts. I have had a long interest in dreams and dream interpretation (starting with Jung and Freud but also developing personally beyond prescriptive interpretation). 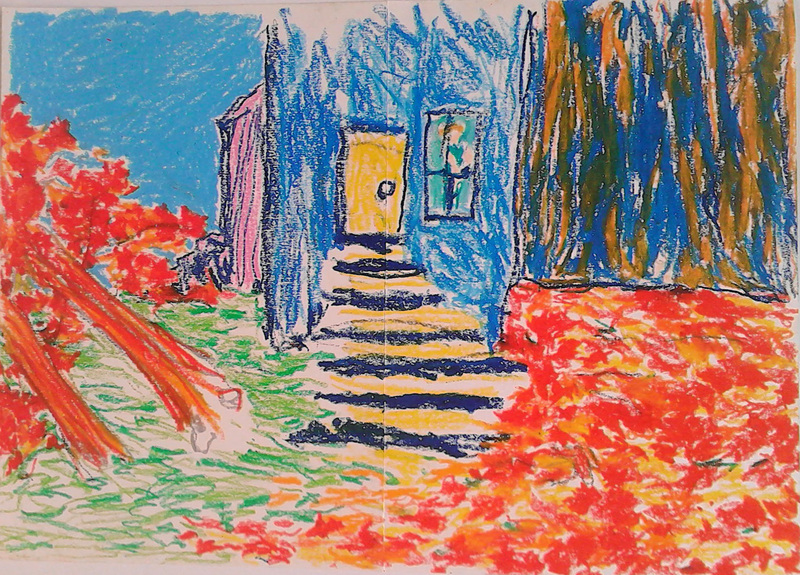 Last week at the studio drop-in (Dún Laoghaire Rathdown Arts Office) at The Lexicon in Dún Laoghaire, I decided I would do a left-handed dream drawing of a recent vivid dream. I am right-handed but have found in the past that doing an entire drawing with the left hand gives me enormous freedom. 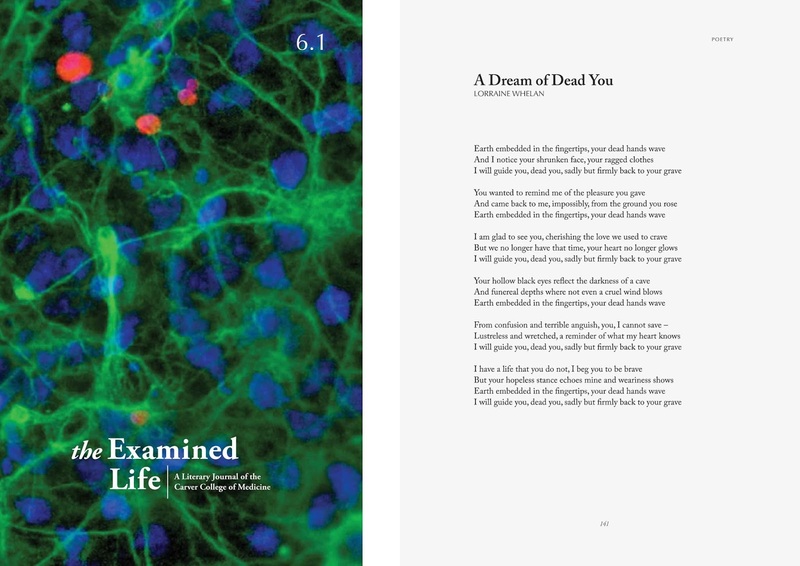 My fascination with dreams has inspired both my visual work and my writing. Recently I have been included on the Poetry Sound Map reading my poem "Portrait", which was published in New Irish Writing back in 1989. My reading is a recent one, and if writing today, I think that perhaps I would have titled the poem "Self-portrait". It is entirely inspired by and describes my interest in dreams. Not all my dreams are about death! 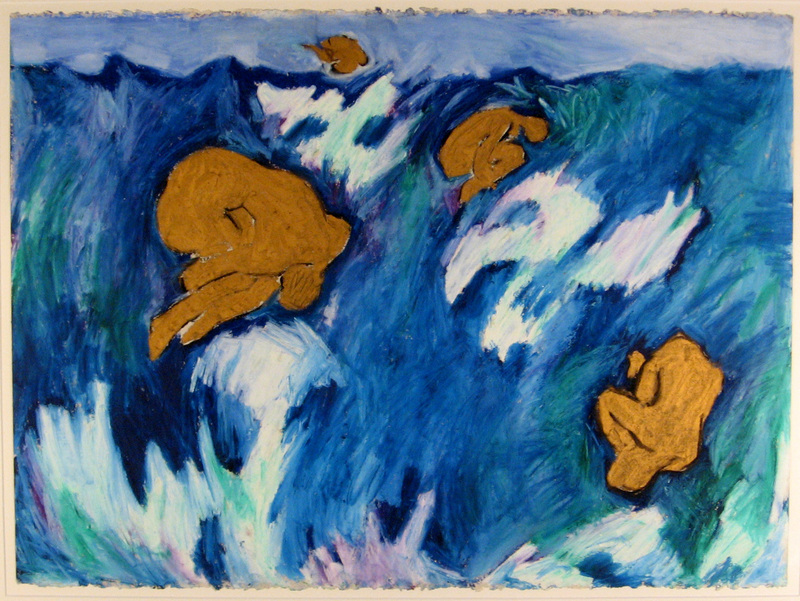 This oilstick drawing, based on a dream, I have entitled "Ocean of Life". I am not sure when I did the drawing, as it is unsigned and undated (at least on the front of the drawing, it is hanging, framed in my hallway!). I think it is drawn sometime in the 1980s and I may have had the dream in 1983 when I was living near Lake Ontario in Toronto. At least it was Lake Ontario that featured in the dream. And I remember the figures joyously bouncing in the rough water. I remember at the time I recognised this as a parallel to a previous dream where a school of dolphins were playfully diving in turbulent waters. This, however, is not a left-handed drawing. In next week's blog, I will continue discussing dreams with more work inspired by dreams. 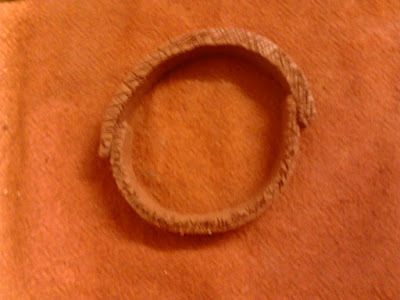 This is a very tiny gift sculpture I made for my boyfriend (now my husband) when we were separated by an ocean in 1988. 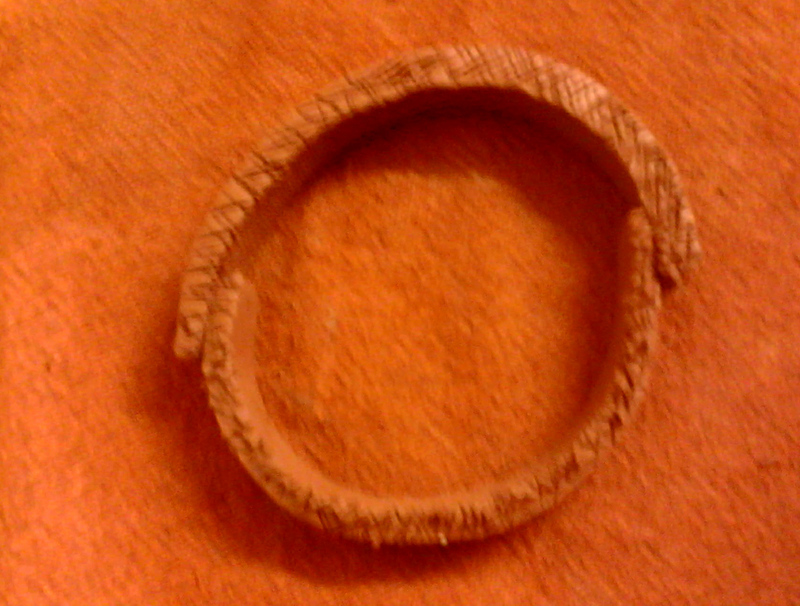 It is based on a sculpture I made in a dream I had around that time. The chairs are moveable. 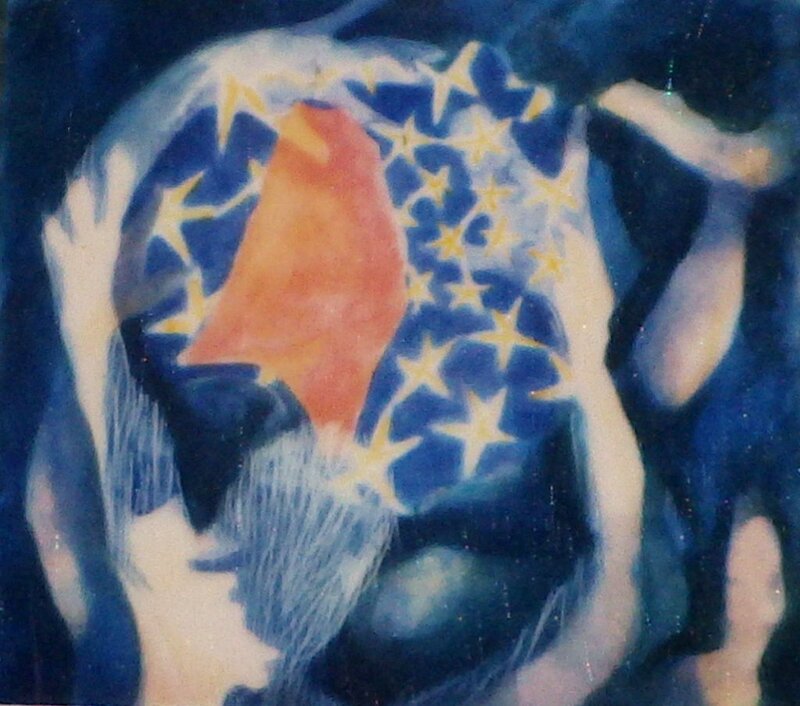 I also think the dream itself was inspired by my mentor at university, sculptor Hugh LeRoy, who I had taken drawing classes with and also asked him to mentor me in independent studies in painting for my final two years in university. Before I had ever met him, I read a review in ArtsCanada about a sculpture he had made featuring an "order" chair and a "chaos" chair. 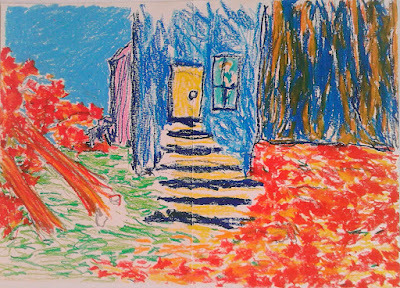 Hugh was also profoundly interested in dream-induced creativity and introduced me to left-handed drawing as a useful method to encourage freedom in drawing. In 1995 I was living in Kerry and amazed by all the calla lily plants on rural home lawns. 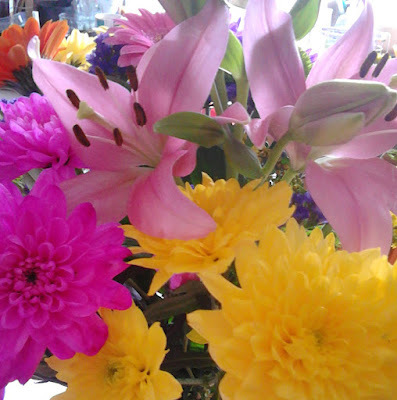 But when I dreamed about them they were brightly coloured instead of white. I made a Father's Day card for my Dad that June, with an image of the dream calla lilies. My Dad died a few months later, and I created the piece "Dreaming for Dad" on 2 large net curtains and the companion small icon diptych. When I exhibited them the following year with other works, "Pastures Green", at The Basement Gallery in Dundalk (now called An Táin Arts Centre) I installed them in a separate room so that a life-death passage was clearly represented. 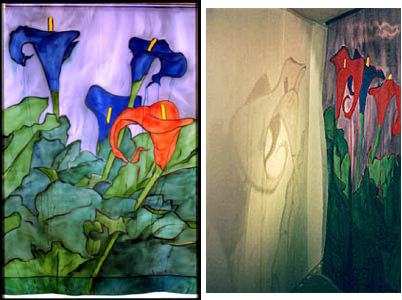 I loved the way the lighting reflected muted images of lilies on the walls. 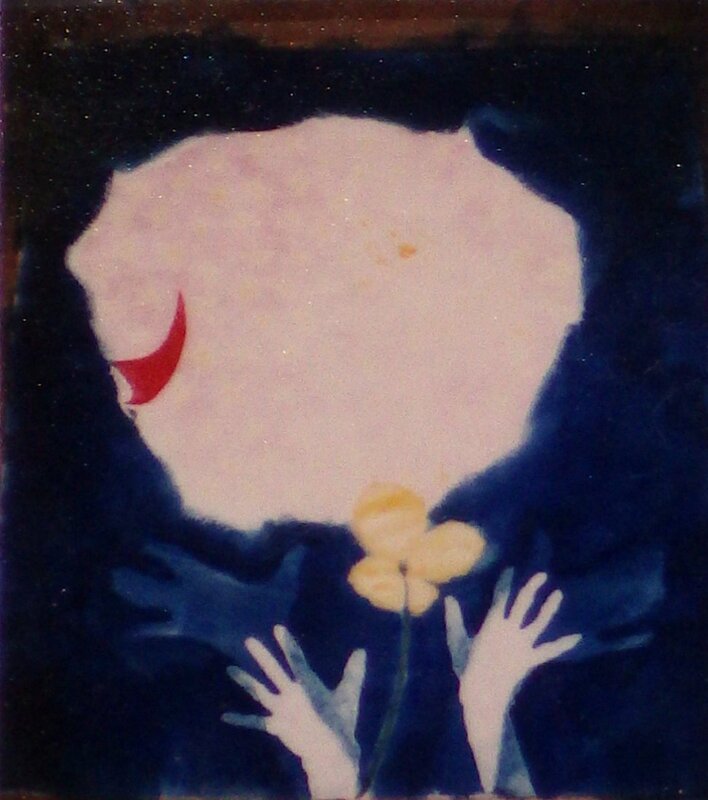 While at a studio residency in the spring of 1989, I enjoyed playing with my dream imagery to create a temporary installation in my studio space at The Tyrone Guthre Centre at Annaghmakerrig. 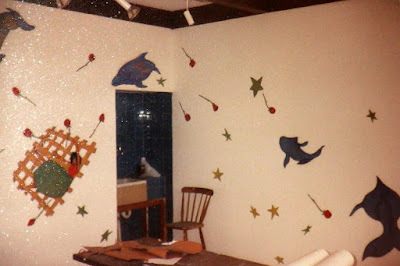 Another painter friend referred to my studio of cut-outs as "The Playroom". I had been granted the residency to finish work for my first solo show in Dublin, but I only had to complete one large drawing for the exhibition and then I was free to let myself go. 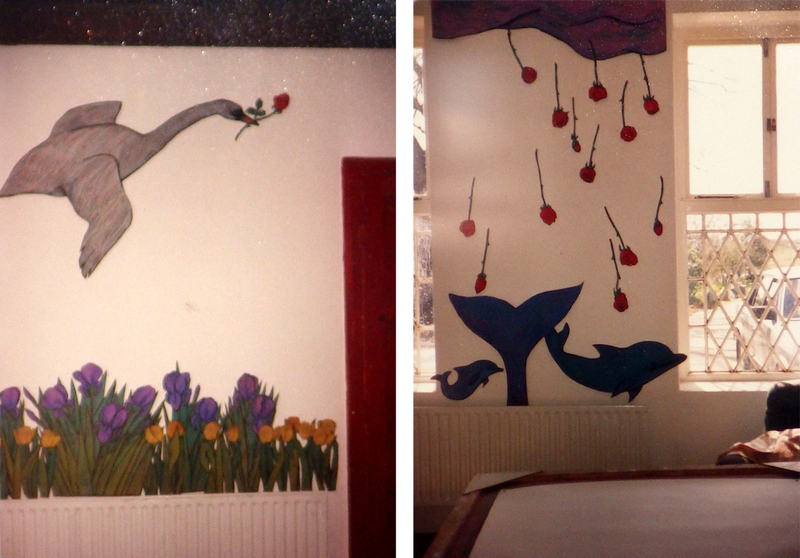 I enjoyed drawing images with pastel, cutting them out and affixing them to every wall in the studio. I know I created this piece sometime after the mid-1980s, based on a dream where I was surrounded by water (but remained dry, kind of like the parting of the red sea in CB DeMille's "Ten Commandments" film) and saw a red-sailed boat in the distance. This is a large (about a metre squared I think) painting/collage on Strathmore watercolour paper - a roll of which was given to me by Hugh LeRoy because he was fed up seeing me disrespect my own work by using newsprint for all my best drawings...I know this work still exists, and is beautifully framed, because it was bought in the '80s by a colleague who is now a very dear friend. This is another piece, also painted on Strathmore paper (from a huge roll) around the same time as the one above, a variation on the same dream theme. However, I am pretty sure this work no longer exists, other than in my mind. 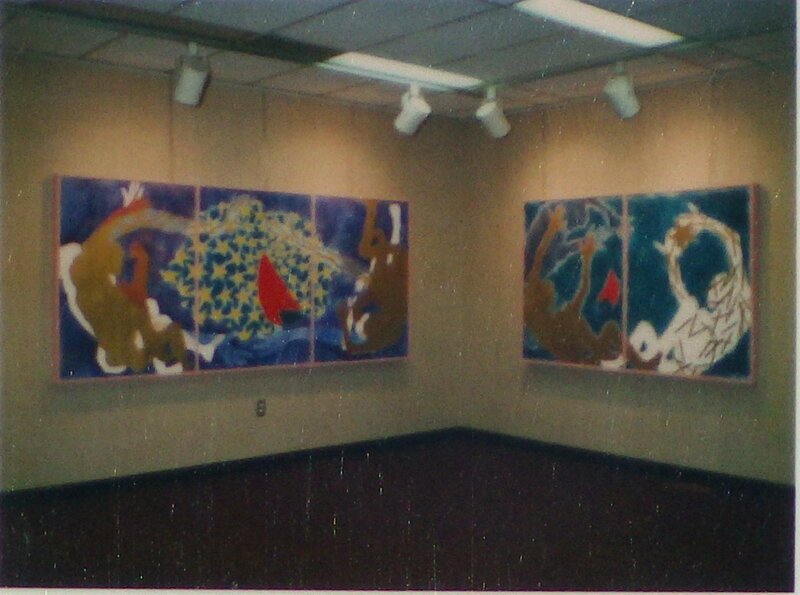 In my last year of university, 1986, I participated in a group show at the Winters college gallery (at York University in Toronto) and with some other work, presented these large paintings (each panel of the triptych and diptych is 4 ft x 3 ft) based on the red-sailed boat dream theme. Both of these paintings no longer exist, having fallen prey to one of my "Great Purges", a necessity when moving back and forth across continents. These dream sketches managed to survive, having been recently discovered in my "Grey Box" archive. 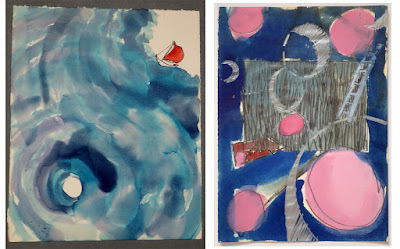 I know the drawing on the left is created on blotting paper (a nice blurry water effect) and the sketch on the right was created while on holiday in Ireland in 1984, presumably depicting a dream I had during that holiday. Recently I was reading a coffee-table book on Charleston, home of Vanessa Bell, Duncan Grant, and (at various times) others from the Bloomsbury Group. The book was written by Quentin Bell (Vanessa's son) and Virginia Nicholson. As well giving me yet another peek at life to satisfy my continued curiosity about the group, I was also interested in seeing, within the rooms of the house, pieces of hand-painted pottery on tables, mantles, bookshelves, etc. Quentin Bell was the potter, but often his mother and Duncan Grant would paint the bisque ware before Quentin himself got to it (or he would leave some pots out for them). 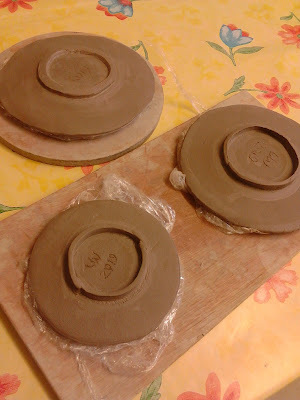 I liked seeing the pottery as I hadn't quite decided how I was going to glaze the slab plates I have made this year. 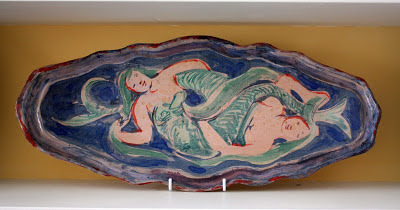 This platter of mermaids is one of Quentin Bell's pieces. Over the past dozen or so years, my annual visit to Antibes has also brought me in close contact with the ceramics of Picasso, which I also find inspiring. 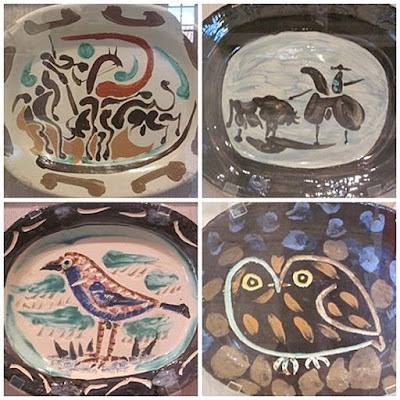 The Picasso Museum at the Chateau Grimaldi in Antibes has a large selection of his paintings on plates. 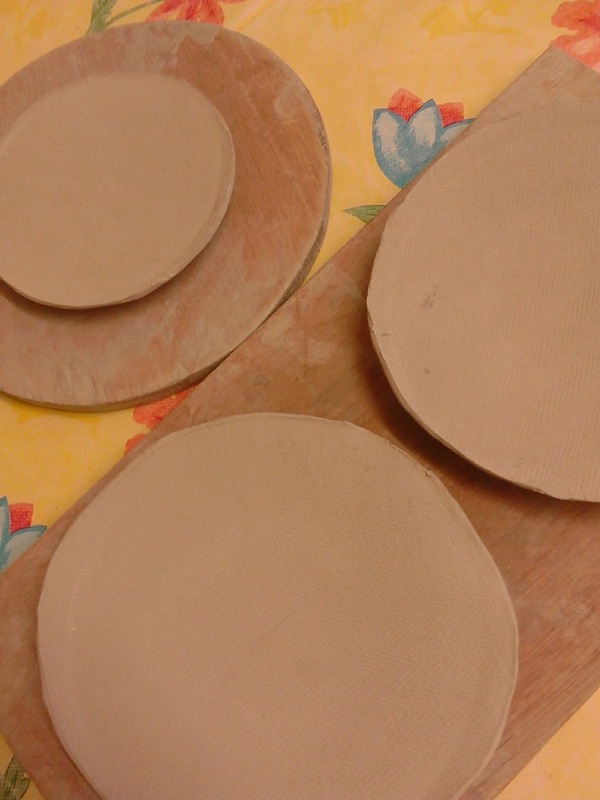 I thought some plates made from a low fire white clay would provide a perfect ground for painting. Since circular slabs were simply draped over pudding bowl lids, I was able to make feet for the plates while the clay was still in its very damp phase. 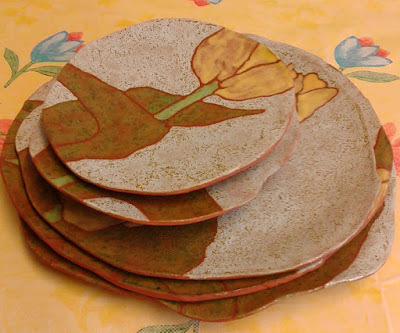 I decided there was something about terracotta that I really liked and decided on using it for a set of plates. 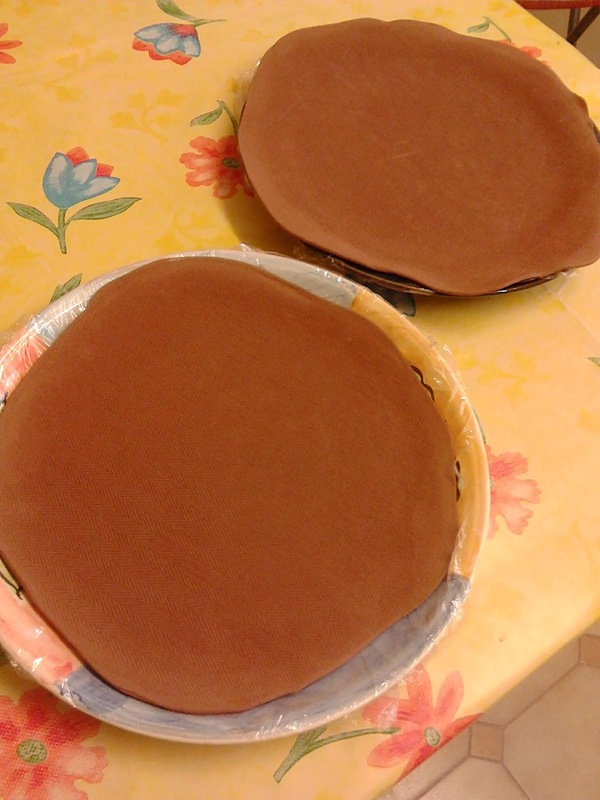 For larger plates I placed the slabs within the curve of a plate as former (cling wrapped first of course!). This meant that I would not be putting feet on the large plates, as the plates needed to dry in their former before I could remove them. I made some smaller plates in terracotta too. As with the white ones the circular slabs are draped over pudding bowl lids. In this photo I have decided the size and location of the feet and scored accordingly. This is a foot, made in two pieces, scored and ready to be placed, with plenty of slip, on one of the plates. Here are the two small terracotta plates with feet attached, signed and ready to dry before bisquing. 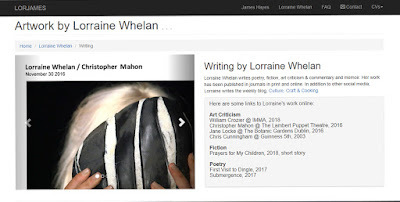 Lorraine Whelan is an artist and writer based in Ireland.